It is a little-recognized, never-celebrated anniversary in American journalism, granted. But tomorrow marks 114 years since the term “yellow journalism” first appeared in print, in the old New York Press, edited by the austere Ervin Wardman (left). “Yellow journalism” quickly caught on, as a sneer to denigrate what then was called the “new journalism” of the New York Journal of William Randolph Hearst and the New York World of Joseph Pulitzer. By the end of March 1897, references to “yellow journalism” had appeared in newspapers in Providence, Richmond, and San Francisco. In the decades since then, “yellow journalism” has become a widely popular if nebulous term — derisive shorthand for vaguely denouncing sensationalism and journalistic misconduct of all kinds, real and imagined. Precisely how Wardman and the Press landed on the phrase “yellow journalism” isn’t clear. The newspaper’s own, brief discussion of the term’s derivation was unhelpful and unrevealing: “We called them Yellow because they are Yellow,” it said in 1898 about the Journal and the World. 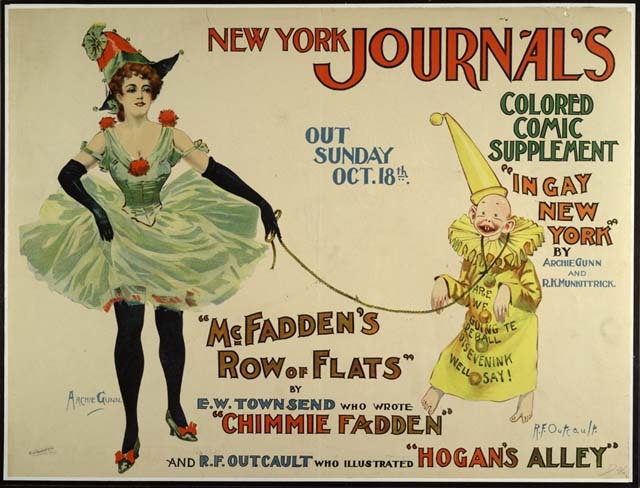 In the 1890s, the color yellow sometimes was associated with decadent literature, which may have been an inspiration to the Harvard-educated Wardman, a figure now largely lost to New York newspaper history. Wardman was tall and stern-looking. He once was described as showing his “Calvinistic ancestry in every line of his face.” He did little to conceal his contempt for Hearst and Hearst’s journalism. Wardman’s Press took to taunting Hearst, Hearst’s mother, and Hearst’s support for Democratic candidate William Jennings Bryan in the 1896 presidential election. The New York Journal was virtually alone among New York newspapers in supporting Bryan’s “free silver” candidacy. Both the Journal and the World at the time were publishing versions of the kid. At the end of January 1897, the phrase “yellow-kid journalism” was modified to “the Yellow Journalism,” and the sneer was born. New York Times practices ‘yellow journalism’? How so?